Whether you’re moving into a brand-new place or ready to upgrade your existing property, the quality of your driveway can have a considerable impact on curb appeal. However, it can be hard to choose between the many paving options available today. To make an informed decision, start by reviewing the advantages and drawbacks of asphalt driveways. Compared to other common paving materials, such as interlocking pavers and poured concrete, asphalt is inexpensive. While it must be sealed to retain its quality, it can last up to 20 years. The color of asphalt is also worth considering—the jet-black hue creates a streamlined appearance with the connecting roadway, resulting in the illusion of a never-ending driveway. It’s this same dark coloring that hides spills and drips from vehicle oil and fuel, and since darker colors absorb more heat, it also makes snow melt faster in the winter. 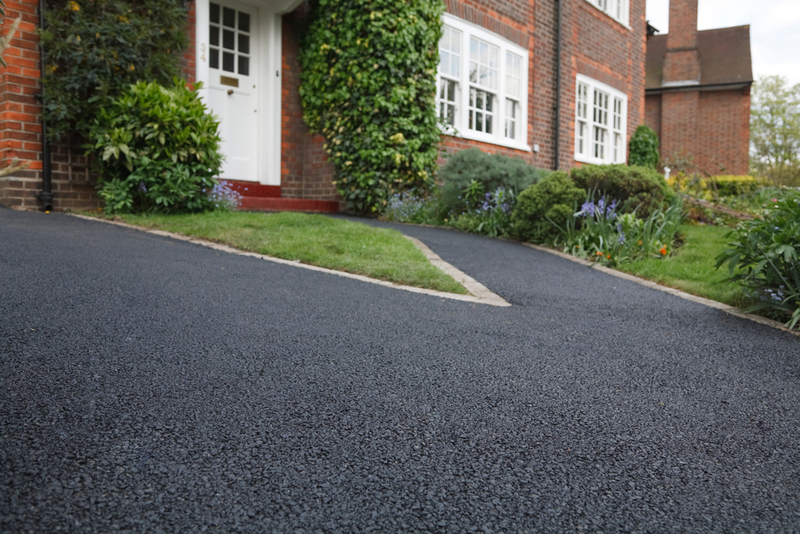 Another benefit of asphalt driveways is that they are easy to repair if cracks or other flaws arise. Plus, while other materials require an extended curing period, you can drive on a newly paved asphalt road the very next day. If the entire surface fades or deteriorates with time, it’s easy to apply a topcoat over asphalt. While asphalt’s dark hue is excellent for melting snow in the winter, it gets hot in the summer—to the point where it may soften and become sticky. As it re-hardens, it may crack or become misshapen. Compared to other materials, asphalt requires a significant amount of maintenance, as it must be resealed every three to five years. It’s also important to clean asphalt by sweeping and pressure-washing on a regular basis. While asphalt is expected to last around two decades, this is still considerably less than other materials, such as concrete. Asphalt surfaces that are not well-maintained may not last more than a decade. If you’re interested in learning more about this paving material, contact the professionals at Midsouth Paving. They serve clients within 75 miles of Dothan, working on everything from curbs and gutters to sidewalks and asphalt driveways. For more information about their company, visit the website. You can also call (334) 712-7500 to request a quote.